For nearly 20 years, Delilah Onofrey was an editor for Greenhouse Grower magazine and has extensive knowledge about flower varieties on the market, where they come from, and how they are best used. She joined the Suntory Flowers marketing team last fall. 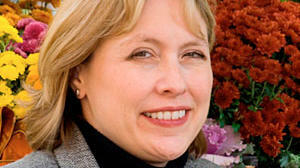 She also is a founder of America in Bloom, a national beautification and community revitalization program. Q: I don’t have a green thumb, but would love to spruce up my back porch with some color. What flowers can I plant together that don’t require much attention? A: First, you need to determine how much sun you get over the course of a day on your back porch. Is it a shady spot or do you get sun at least half of the day? Most of the annuals prefer sun. Traditional choices for shade include impatiens, begonias and fuchsias. If you’re looking for colors you won’t find in impatiens and begonias, try torenias, which come in cool blues, purples, yellows and even silver. If your back porch gets plenty of sun, your options dramatically increase. Petunias in general are very strong performers, but you still need to pick off spent flowers or deadhead them. Calibrachoas, which are similar to petunias but have smaller flowers, are self-cleaning and do not require deadheading. These are commonly known as Million Bells. Geraniums are easy to care for and can tolerate dryness but you still need to deadhead them. Mandevillas have really been catching on in popularity and provide a tropical look all summer in shades of crimson, pink and white. Blooming tropicals are a hot trend. Q: How can I keep flowering vines under control, and growing in the direction that I want? A: Flowering vines have become more manageable than ever, thanks to new breeding and new products that support vines. As far as keeping vines under control, the key is to not choose a vine that will become invasive. For instance, Trumpet Vine (Campsis radicans) is one I wish I never would have planted at my house. Clematis continues to be a popular perennial vine that is easy to manage and many new hybrids are available. Some of the newer vines are annuals. The new mandevilla hybrids are especially exciting with more flower power and disease resistance than ever before in rich reds, pinks and whites. When selecting a mandevilla, make sure it is a vining type, if you want a vining type. Some of the newer ones are bush types for those who love the flowers but aren’t as interested in vines. Other distinctive annual vines include thunbergia (Black-eyed Susan vine) and lophospermum, a truly unique item that’s also known as creeping gloxinia, with wine red or creamy white flowers and elegant leaves that resemble grape leaves. The key to controlling and containing a vine is to plant it in a large patio pot or whiskey barrel and support it with a trellis, obelisk or cage. You can even create a very simple support structure with three bamboo stakes arranged to come to a point like a teepee in a patio pot. Many vining plants are sold in pots with support structures. As plants grow, tuck the vines into the supporting structure and they will naturally guide themselves. Trim any wayward vines or excess length. Many gardeners don’t realize vining plants also make beautiful hanging baskets because they are natural trailers. Just as in patio containers, the vines can be trained to continue to wrap into the plant for a basket, like an upswept hairdo with tendrils hanging down. Q: I’m always excited when I first plant my flowers in the spring but become disappointed when they aren’t holding up or are looking ragged in late July or August. Which varieties will go the distance all summer? A: One ideal source to see which plants perform the best in your region is to consult university trial grounds. Many can be found on the All-America Selections website. You can also select plants that are naturally drought and heat tolerant. Beautiful examples are angelonias (summer snapdragons) in shades of purple, pink and white; scaevolas (fan flowers) in shades of blue and white; and nierembergias (cup flowers) in blue and white. Helichrysums make a nice groundcover and mixed container or basket accent with silvery green foliage and hundreds of yellow button flowers. And ipomoea (sweet potato vine) provides a trailing accent that fills and spills all summer in shades ranging from lime green to blackish burgundy. Some leaves are heart-shaped and others like an oak leaf. The newer ipomoeas are more contained and won’t engulf companion varieties in mixed containers and baskets like the early varieties do. The more vigorous petunias will go the distance all summer.